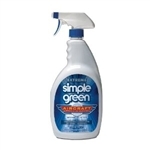 Simple Green Aircraft & Precision Cleaner in a 32 oz trigger spray bottle. Simple Green Aircraft & Precision Cleaner in a 5 gallon pail. Simple Green item # 0100000113405. Simple Green Aircraft & Precision Cleaner in a 55 gallon drum. Simple Green item # 0100000113455.